Sewn and Grown: Cherri House Event! The Philadelphia Modern Quilt Guild is hosting Cherri House, author of "City Quilts" on Friday, April 8th at 7:30pm in Huntingdon Valley. 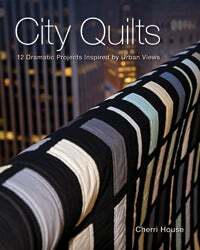 She will be showing quilts from her book as well as discussing the use of solids in quilts. Cherri will be bringing copies of her book as well as patterns that will be available for purchase. This event is free for all paid members of the Philadelphia Modern Quilt Guild. Guests are welcome to attend for $5. To RSVP, email the guild at phillymodernquiltguild@gmail.com.